K-Tek, makers of audio gear for high-end sound recordists, introduces Airo by K-Tek, a new line of essential audio tools especially designed for content creators of all types who require quality, affordable audio sound for their video. Although the Airo brand is new, the company behind it, K-Tek, has a rock-solid reputation for designing award-winning equipment custom tailored to the needs of top audio mixers and boom pole operators for the past 21 years. Utilizing that depth of experience and input from professional operators, the Airo line provides a variety of fundamental tools from boom poles to mixer bags, based upon those used on Hollywood production— at prices to suit entry-level users. 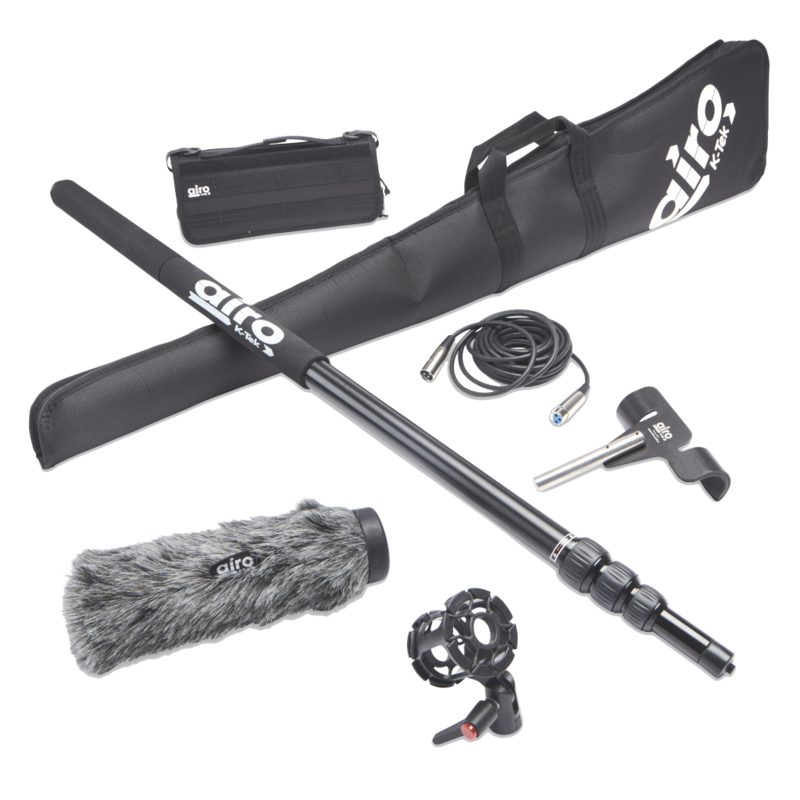 Launching with six essential tools, the basic Airo Boom Pole 1 (ABP1) is a practical pro-style, $100 solution to support the microphone close to the audio source when recording. With a collapsed length of 3’ 2.5” (98cm) and an extended length of 10’10”(330cm) the 1.6-pound (725g) Boom Pole is made of black anodized aluminum and features rubberized collars and a foam grip to reduce unwanted handling noise. A trusted boom holder is essential for sit-down interview situations or when the microphone remains suspended in one spot. The Airo Boom Holder 1 (ABH1) is made in the USA, priced under $50 and does the task like a pro. With a smart and functional design it is built rugged of black anodized aluminum, yet features a gently padded cradle to protect the boom. A shock mount is vital for shotgun mics. The Airo Shock Mount 1, (ASM1) uses K-Tek’s trusted microphone suspenders to isolate the mic from vibration and cushions it when the boom is swinging. Offering the functionality of expensive professional shock mounts in a more basic package, the ASM1 is listed at $29.95. To transport audio equipment and to work more conveniently on set, Airo by K-Tek offers a better carry bag and a completely unique mixer solution with loads of professional effective advantages.